As Google and Facebook are projected to account for over half the share of US digital ad revenue this year, what does this mean for the digital advertising ecosystem and all the players within it? 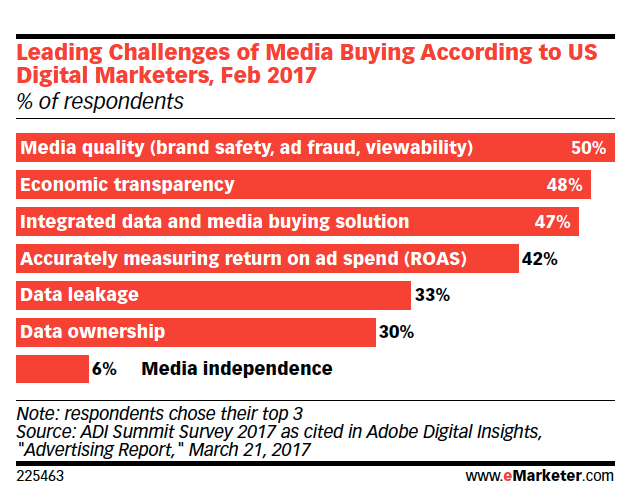 eMarketer’s recent report, “Beyond the Duopoly: Exploring Digital Advertising Outside Google and Facebook“, dives into the dynamics of US digital advertising/marketing entities outside Facebook of Google, and explores what other platforms and publishers offer to meet the needs of advertisers. The report, which includes Exponential’s Rick Abell (VP of Global Publisher Development) as a source, touches more specifically on topics including brand safety, audience targeting, contextual relevance, the pivot to video, and the need to work with more than one platform. An excerpt from the report on topic of brand safety is shared below and you can view the full report from eMarketer here. Quote and graph source: Perrin, Nicole. Beyond the Duopoly: Exploring Digital Advertising Outside Google and Facebook. EMarketer, 2017, Beyond the Duopoly: Exploring Digital Advertising Outside Google and Facebook, www.emarketer.com/Report/Beyond-Duopoly-Exploring-Digital-Advertising-Outside-Google-Facebook/2002174. To learn more about how Exponential helps advertisers ensure campaign brand safety, check out our Advertiser’s Guide to Brand Safety.